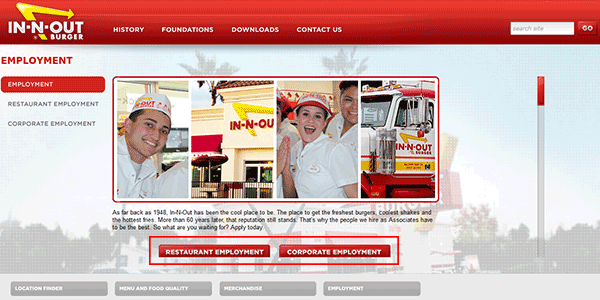 The In-N-Out job application can be completed online by going to the employment website, or offline by printing out the .PDF document (click the above download link/button). Both restaurant and corporate careers can be applied for via the employment site. About the Company: In-N-Out is a chain of fast food restaurants primarily based in the Southwest and Pacific Northwest United States. The company was founded in Southern California in 1948. There are currently more than 300 locations throughout the aforementioned regions. 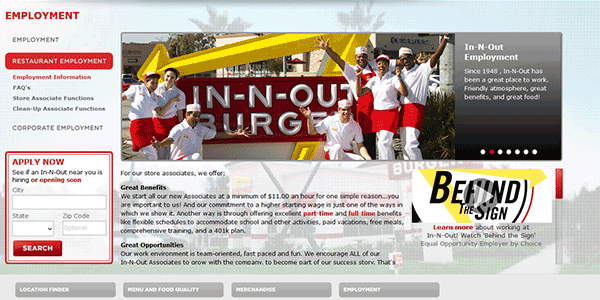 Step 1 – Go to the main employment site (http://www.in-n-out.com/employment.aspx). Step 2 – Choose whether you want to apply for restaurant or corporate positions. Step 3 – If you’re applying for a restaurant position, use the location finder to see if a location in your area is currently hiring (enter a city/state). Step 4 – Press the “Employment” button of the location you’re interested in working at. Step 5 – If the location is currently accepting applications press the “English” (or “Spanish”) button. Step 6 – Select which job you want to complete an application for. Step 1 – Download the form by clicking the link at the top of the page. Step 3 – Complete the questionnaire portion of the document, and then submit your education history information. Step 4 – Sign your name and then fill in the date.